With summer finally here, we have to ensure that we use sunscreen lotion to protect our skin from overexposure to the sun’s harmful UV rays. The problem is that most Americans are clueless when it comes to reading and understanding the labels on sunscreen bottles. I know all too well how desirable it is to get the perfect tan—I hear it from my patients all the time during the summer months. However, what’s more important: protecting your health or getting the perfect shade? Unfortunately, even though you may be wearing sunscreen every day, you could be going about it all wrong, meaning you’re not getting the protection you need. In fact, I recall a study that was published last week in JAMA Dermatology in which participants were tested on their knowledge of sunscreen lotion and the majority failed. Shockingly, only 23% understood what type of sunscreen lotion was best used to protect against sunburns and only seven percent knew which sunscreen to use to prevent premature aging. Most of the study participants didn’t understand the labels because they were misinformed or simply lacked knowledge on UVA and UVB protection. For example, participants didn’t know that sunscreen with high UVB protects from sunburns, and sunscreen with a high UVA protection can help prevent skin aging. Fewer participants understood that UVA and UVB radiation could lead to skin cancer. While the researchers discovered that 93% of participants had bought sunscreen in the past year—75% said they bought it to prevent sunburns and 65% said they bought it to prevent skin cancer—the previous notes suggest what they bought likely wasn’t doing what they thought it was. Furthermore, study participants primarily based their sunscreen purchases on the SPF factor and whether it was sweat- and water-resistant. Regardless of why they decided to buy the sunscreen, only 43% of participants knew how much sun protection was good for their skin and 38% were able to tell which sunscreen products could protect them from skin cancer. The takeaway point from this research is that the terms on sunscreen labels can still be confusing for many consumers. Still, most dermatologists recommend that consumers purchase sunscreen with at least SPF 30. Below are three basic terms that you should be aware of when reading the labels on sunscreen. The sun protection factor (SPF) simply measures how well a sunscreen will protect you from the sun’s UVB rays. UVB rays can cause sunburns and contribute to skin cancer; the SPF determines how long you have before you can get sunburned. For example, if you typically get a sunburn in 10 minutes, if you apply an SPF 30 sunscreen, it should take about 300 minutes to get sunburnt. Doctors recommend that consumers reapply sunscreen every two hours to be on the safe side. Keep in mind that higher SPFs don’t mean more protection—in fact, a sunscreen with SPF 50 or higher may not be necessary. Studies show that sunscreens that are higher than SPF 50 don’t offer that much more protection than a bottle with SPF 30. Some people who buy sunscreens with higher SPFs tend to believe it will protect them for longer, and they may make the mistake of not reapplying as often. Experts generally recommend consumers buy sunscreen with SPF 30 and reapply it throughout the day. UVB rays can tan or burn your skin—making them the primary culprit for skin cancer. On the other hand, UVA rays won’t cause sunburn, but they do penetrate the skin more deeply, leading to signs of sun poisoning, aging, leathery skin, wrinkles, and sagging. When you purchase sunscreen, make sure it says “broad spectrum UVA/UVB,” which means it protects your skin from both UVA and UVB rays. If you plan on swimming or being physically active in the sun, then purchase a sunscreen that’s water-resistant or sweat-resistant. Keep in mind that these sunscreens aren’t foolproof; you’ll typically only be protected for up to 80 minutes in the water, meaning you’ll still have to reapply your sunscreen throughout the day. It’s recommended that you reapply your sunscreen after leaving the water, sweating too often, and at fairly frequent intervals throughout the day, even with these types of sunscreen lotions. Don’t opt for a combination sunscreen-bug repellant: Some sunscreens provide a combination of sun protection and bug repellant. Although it sounds like a cool combo, they might not provide the best protection against either. For example, sunscreen might have to be reapplied more often than the repellant is needed. Or the compounds found in the repellent might not be safe for the face or on sensitive skin. Opt for a lotion: Spray-on and powdered sunscreens may seem easy to apply, but I’d argue that they don’t offer the best coverage that lotions provide, since it’s more difficult to tell how much you have applied. You also run the risk of inhaling these forms of sunscreen, so I’d opt for a lotion. Apply before going outside: Remember to apply approximately 30 minutes before going into the sun and reapply every two hours (or sooner if you are swimming or sweating). Sugar, J., “Confused About Sunscreen? What To Know Before You Buy Your Next Bottle,” POPSUGAR web site, May 28, 2014; http://www.popsugar.com/fitness/How-Choose-Best-Sunscreen-23353428. 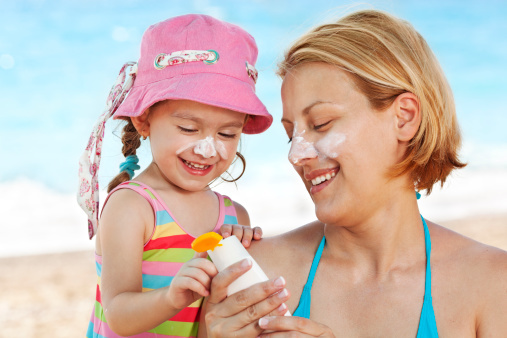 Langfold, C., “Most Americans Misread Sunscreen Labels,” Wall Street OTC web site, June 21, 2015; http://www.wallstreetotc.com/most-americans-misread-sunscreen-labels/219161/.